Hello friends, ready for day 2 of Christmas Decorating? Well I am and I am so happy to show you this project. It has been twirling in my mind for ages, and it feels so good to finally have it out of my head and into my home. Today is a special day. 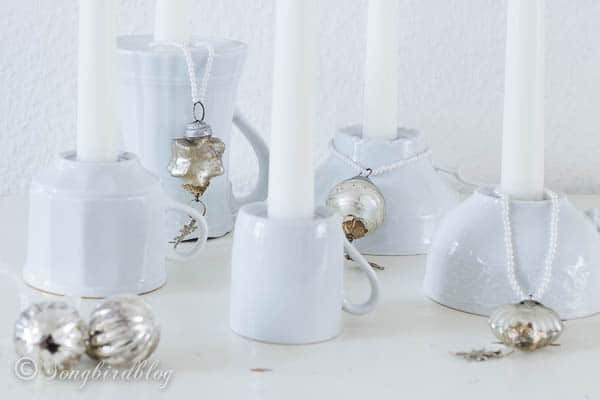 I am not only celebrating 12 Days of Christmas with five other awesome bloggers, I am also participating in another Junkers United Day with 13 other thriftstore loving and recycling geniuses. So come on in and feel welcome! Todays project took a long time to plan and only 30 minutes to make (with the help of My Love). And it turned out so good, better than I had thought. I got the idea a long time ago. I think I caught images of an upside down teacup candle holder somewhere on Google and it stuck. And ever since I have been on the lookout for the proper materials to make this. A couple of weeks ago I lucked out and I was ready to go to work. Basic DIY is simple: drill holes in thrifted teacups, coffee cups, espresso cups and/or small pitchers, stick candle holder inside and call it a day. My man did the ‘heavy’ work on this one, while I “managed” the camera. I had been doing some test drills with several drill bits, but they wouldn’t go through the porcelain. Surprisingly resilient that stuff: concrete drills, tile drills and stone drills where merely capable of scratching it. To effectively drill a hole in a cup (or saucer) you will need a diamond drill bit. Like these. They need to be water cooled, hence the set up inside a container filled with water. These babies went through the bottom of the cups like butter. 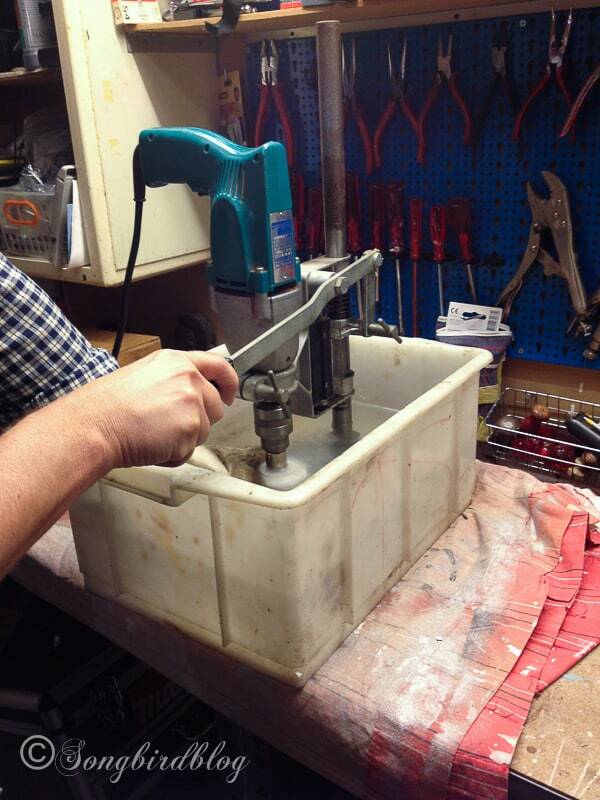 To make sure that you drill perfectly vertical and that you don’t slip, a drill stand is the way to go. If you have steady hands you might not need it, but for us it made the job so much quicker and easier. The man set up the drill inside the drill stand. That stand used to belong to my father in-law. I am sure he could not have fathomed that we would use it to drill through tea cups, but I am sure he would have approved. Now that you have your basic tools collected it is time to go thrifting. Go find yourself some cups. Since I am a big lover of all things white, I went for these basic tea cups. But I think some pretty floral vintage cups would look great too. Choose a variety of sizes and heights. This was my first loot. I later added the espresso cup and the milk pitcher to add some more variety. Just remember, you are going to use these upside down, so turn it over before you buy. The bottom should be undamaged and when turned over it should stand straight (jars and pitchers are sometimes wobbly when standing upside down). Finding the candle holder was the most difficult part of this project. It took me more than a year to find them. I had already tried to come up with all kinds of alternatives until I found these. The link is to an European craft store, that ships internationally (I think). The drilling part was fun. Here is a very short but mesmerizing video. As I said I was in charge of the camera and my battery went flat just moments into filming this. Go figure, the one thing I was supposed to do….. I used a bit of glue to secure the candle holders in the cups, but I don’t think it is really necessary, they are not going anywhere. And then it was time for the foofing and decorating….. I think those little ornaments take this project right into Christmas. After all there is no such thing as too much candle light and silver ornaments at Christmas. Funny that the last one we made: the little milk jug, is also my favorite. And when Christmas is over, I’ll just remove the ornaments and I’ll have teacup candle holders that are perfect all year long…. Ha, how about that junking project. Did I get you in the mood for more? Well don’t worry there is plenty to explore. 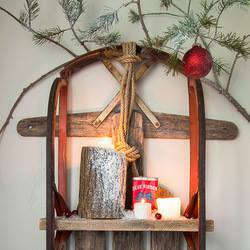 Please visit my Junking buddies to see what repurposing, recycling, junking Christmas projects they came up with. And of course don’t forget to visit my 12 Days friends too. One of them is having a Giveaway!! You’ll have to hop around to find it. Don’t forget to come back tomorrow!! 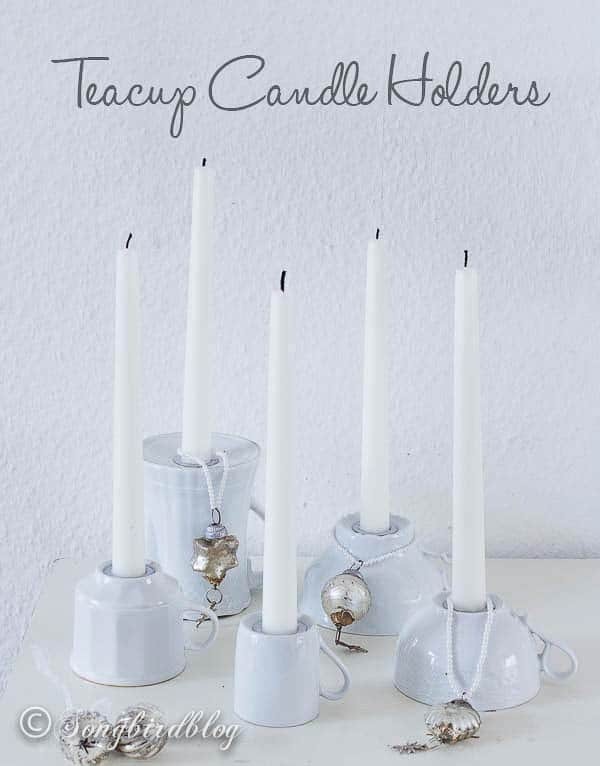 What a clever idea for candles! I love your neutral Christmas decor, Marianne! 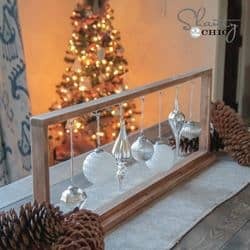 These look beautiful, Marianne, and I love that they can be used year-round! So very pretty Marianne. We have a wet saw, I have teacups, but do we have the right bits? If so I’ll be giving this idea a whirl myself. I have always wanted to try a project like this – so clever and thanks for all of the useful information! Marianne – Wow. You have some fancy tools over there! 😉 Haha, but totally worth it. I love the end result! So special and festive! These are so fabulous. Love your creativity on these. Beautiful. This is simply lovely! I want a drill press! I’ll get on it, right away. I’ll do anything for you…..
Love love love it! And I have learned something new again. Thanks for the link to the candle holders, I have been looking for those to put inside gourds for winter. You are welcome! Glad I could help you out with your project. Good idea to put hem in gourds, will look pretty I am sure.